Earn up to 4,495 reward points. Small, smart, and surprisingly loud. 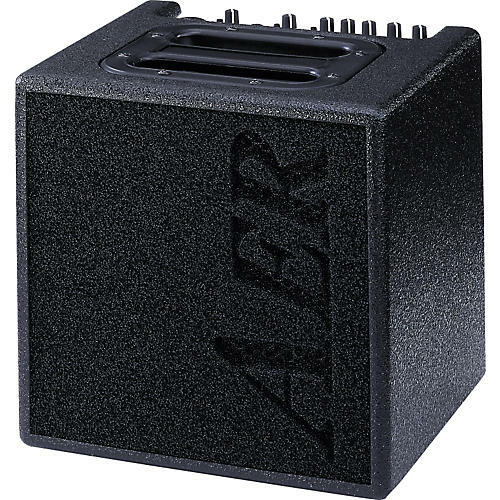 The AER Alpha is a compact combo amp for acoustic instruments. It has one channel with 2 individual inputs that allow parallel use of instrument and microphone, even though the instrument is the main focus. Inputs each have their own gain knob. Birch plywood cabinet provides great tone projection and is road tough. Dynamic controlled 40 Watts RMS and the 8" twin-cone speaker system give perfect performance at all sound pressure levels. Onboard reverb, external effects loop and headphone out. The Alpha amplifier defines the starting point of serious acoustic amplification at AER. Based on the success and the experience with the Compact 60 they have developed an even smaller, lightweight model that has no difficulties living up to the rigors of the road. Amazingly reduced, without losing what is essential for superb performance - the Alpha is a full size member of the AER product family. Open sounding and quick in response, this guitar amp masters different ranges and is not afraid of bigger instruments. The AER Alpha has an integrated (internal) digital reverb effect on board. The return control determines the intensity of the effect (as far to the left as possible means no effect). Furthermore, a supplementary effect device can be connected (external effect). For this purpose, use the sockets send and return at the rear of Alpha to connect the external device (send to the input, return from the output of the external effect). The intensity will then be set by the controls of external effect device. A standard double foot switch can be connected to the footswitch socket on the rear of the amp with a stereo cable. This switch can be used to turn the internal and external effects on and off.